Historic Scenarios - Now YOU are in command! EPIC Napoleonics is the sixth expansion for Commands & Colors Napoleonics game system by GMT Games. EPIC Napoleonics allow for fighting larger battles with more units. EPIC Napoleonics is actually two game systems in one - the Epic Battle system, and the La Grande Battles system. Although the scope of our Napoleonic game has changed, the historical feel and the basic rules of play, for the most part, remain the same. To experience the maximum enjoyment with these two new Napoleonic game formats, both EPIC Napoleonics and La Grande Battles scenarios are best played using the Command card and Tactician card decks that were part of the Generals, Marshals and Tacticians expansion. Knowing that it is not always easy to muster eight players, the EPIC Napoleonic game is set up to play very well by just two players. Or if players so desire, the EPIC game, can in fact, be expanded to include four and even six or eight players. In an EPIC Napoleonics game, one player on each side assumes the role of the Commander In Chief (CIC). Each CIC has a hand of Command cards and on a turn must play one card from his hand to order units in one section of the EPIC battlefield. Also on the turn, the CIC must select one card from the Courier rack to play. The Courier rack is a new game mechanic. 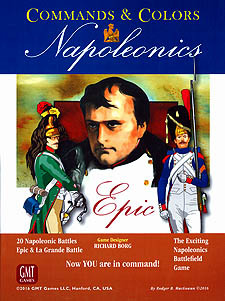 EPIC Napoleonics will allow two or more players to enjoy a truly Epic size battle, but it is important to note in order to play most EPIC Napoleonic scenarios, players will need a copy of the Commands & Colors Napoleonics game and its expansions (Spanish, Russian, Austrian, Prussian and Generals, Marshals and Tacticians). This EPIC Napoleonics expansion will only provide enough units and terrain to fill any gaps. Normally a La Grande Battle game is best played with eight players. Four players will take command on each side. One player, on each side, will again assume the role of the CIC. The other three players will each take on the role of a Corps field commander. In a La Grande Battles game, each Corps field commander also has his own hand of Command cards. As for La Grande Battles it is not the intention of GMT Games or myself, to require a player to buy multiple copies of the Napoleonic game to play a La Grande Battles scenario. I would truly hope, that two friends, both who own copies of the Napoleonic game and expansions could come together with their games, and set up a La Grande Battles scenario to share in the fun with eight friends. The focus of this expansion is therefore on EPIC Napoleonics to allow more players to keep enjoying the Commands & Colors Napoleonics game, while the La Grande Battles rules and scenarios are provided for players as an added bonus.